Weekend Kits Blog: Colorful & Contemporary... Punch Needle Kits! Colorful & Contemporary... Punch Needle Kits! We have new kits in the Punch Needle Kits section of the store! It's easy to see why punch needle is gaining renewed popularity as a creative needleart craft. Punch needle embroidery is an easy craft to learn and kits make it easy for anyone to give it a try. Contemporary punch needle kits are perfect for today's home decor. Here are 3 new designs from Dimensions that you won't want to miss! 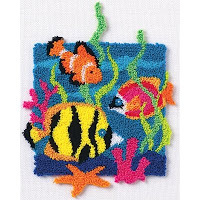 The Tropical Fish Punch Needle Kit is a bright & colorful punch needle design. Kit includes foundation fabric with pre-printed design, cotton thread, and easy to follow instructions for beginners. Finished design measures 8" x 10". You'll need a 3-strand punch tool and an embroidery hoop to complete your punch needle project. Dimensions offers an affordable punch needle tool that is designed to complement their punch needle kits. Loops are created by pushing the threaded needle tip all the way down through the fabric and then pulling it back up just until the tip of the needle reappears. You'll simply repeat this push & pull motion to outline and fill in each area of the design. 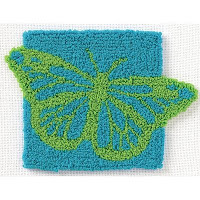 The Single Butterfly Punch Needle Kit is a new two-tone design that is both contemporary & elegant. The smaller size of this design makes it an easy weekend craft project. You'll find that punch needle designs stitch up quickly as you develop your own rhythm. This design requires a 6" embroidery hoop for stitching. It's important to secure your entire design within the hoop. Your foundation fabric should be taut inside the locked hoop, but the design should not be distorted. You will need to stop occasionally to retighten your fabric as your work. 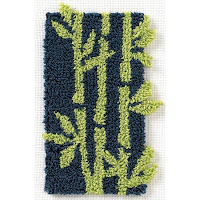 The Asian Bamboo Punch Needle Kit uses two modern tones of green to create a simply beautiful design. Your finished needleart will look lovely matted & framed for display in your home or for giving to a friend as a creative handmade gift. The Dimensions Needlecrafts website offers articles to help beginners get started in punch needle embroidery. Visit the Punch Needle Tips section for advice on threading your needle, how to punch, using a hoop, and more! Visit the Punch Needle Kits section to see our complete selection of punch needle kits, including a nice selection of both contemporary & traditional punch embroidery designs. Explore a wide variety of creative craft kits at Weekend Kits, including kits for beginners and experienced crafters too. Visit today and be ready to start crafting on your next Weekend at Home! Mini Christmas Quilt Kits - Easy for Beginners!